Hello, friends. Today is a sad post, indeed. I have been meaning to pass on this tid-bit of information ever since we got back from our trip, but I kept putting it off forgetting. Remember how I always raved about the ice cream cookie sandwich and how it it was not only one of our favorite Disney snacks, but it was one of the best snack deals you could find if you were on the Disney Dining Plan? Well, it is still one of the Elrod’s favorite snacks to get on Disney property. 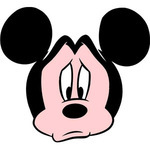 However, it is no longer on the Disney Dining Plan, and therefore it cannot be obtained with a Disney Dining snack credit. Boo hoo hoo! The Elrods were in serious mourning over this one while on our trip this year. I promise to try to keep you on the up ‘n up with the happenings in Walt Disney World, so I felt I should let you know, lest you go to Disney with the expectations of getting an ice cream cookie sandwich with your snack credit, per our advice, are unable to do so, and Elrods Go Disney lose all credibility and trust in your Walt Disney World vacation knowledge resources. 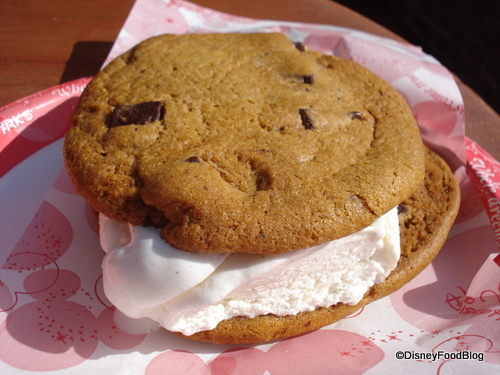 So lets all have a moment of silence, shall we, for the removal of the ice cream cookie sandwich from the Disney Dining Plan…and then lets all whip out our wallets and pay for it in cash, because we know we want one anyway. Snif. Snif. Why did you have to bring this up. Waaahhhh!